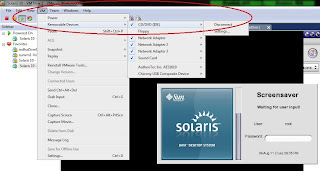 Solaris Unlimited: How to mount a removable media on Solaris 10? Mounting the removable media CD-ROM, DVD-ROM and USB media can be preformed either by running Volume Management daemon (vold) or by mounting it manually by executing ‘mount’ command. Here we discuss both the ways to mount a USB media with pcfs (PCFS – Personal Computer File System. Allows read and write access to data and programs on DOS-formatted disks that are written for DOS-based personal computers.) file system. 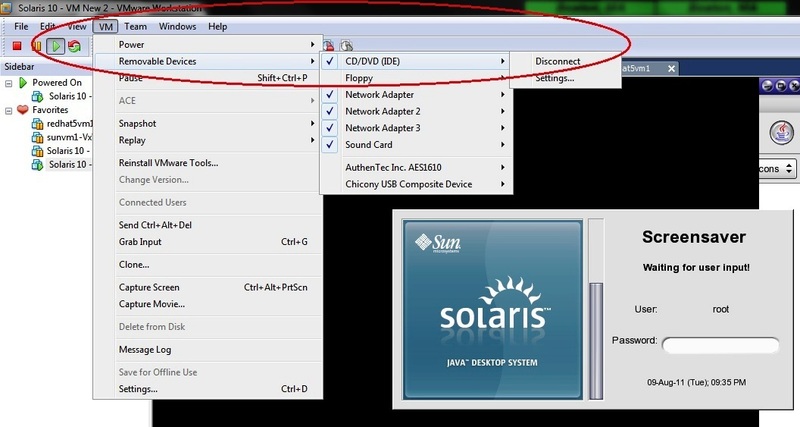 Before performing the task of mounting removable media make sure that those media are recognized by the Solaris Operating System. To know the instance name of the media is very important as it’s required to mount the media manually. 1. For people working with VMWare Solaris 10 box, to make the removable media on the virtual host have to enable the options on VMWare. Please ref to the picture posted. Choose: VM ->Removable Devices -> choose the devices accordingly which is required at the virtual host. 2. If the removable devices are accessed on virtual host, those devices cannot be accessed on the physical host until its disconnected from the virtual host. 3. To use USB media to the Virtual host, Edit settings of the Virtual host. Also it’s very vital to keep in memory that, these edited settings come into existence only after reboot of the virtual host. The above command df –h displays what are the devices mounted on the host. First let’s discuss how to mount the USB removable media by running Volume Management. The above script starts the Volume Management daemon vold. The above script refers and read the file /etc/vold.conf. 1. The file lists out the action to be performed by vold daemon when it get started and stopped. 2. The file lists out the file system supported by the vold daemon. 3. The file refers and execute the script /usr/sbin/rmmount (The rmmount utility is a removable media mounter that is executed by Volume Management whenever a removable medium such as a CD-ROM or a floppy, is inserted. ‘rmmount’ command can also be executed to mount removable media, which refers to the file /etc/rmmount.conf ). # ident "@(#)vold.conf 1.27 06/01/20 SMI"
# ident "@(#)rmmount.conf 1.12 00/08/29 SMI"
# Removable Media Mounter configuration file. -h = Displays the total size, used size, available size in human readable format. -F = Follows with the file system, displays only the devices mounted with specified file system. Once the Volume Management daemon is stopped, the removable media gets unmounted automatically. 1. CD-ROM/DVD-ROM can be ejected whilst vold daemon is running, if its not accessed. 2. If the removable media is mounted manually through ‘mount’ command, CD-ROM/DVD-ROM cannot be ejected. Devices have to be unmounted manually. 3. Once the vold daemon is started, even after the reboot the system, the daemon keeps running until it’s stopped manually. 1. Know the instance name of the device to be mounted. 2. Know the file system of the removable device to be mounted. 3. Create and know the mount point for the device to be mounted. -F = followed by file system, is used to mount the device with the specified file system. Accessing the removable media made simple.